If you want to get right into the Ancestral Trauma Spread, skip down to the bottom! My beautiful and ever naughty 7 year old Staffordshire rescue has a rope chew toy. It used to be fun to play with him; give him a little tug to get some tension in his jaw out, but now, I won’t touch the toy, it’s disgusting. It went from a white rope with a small knot at the end to a gnarled up grey sticky matted mess. It used to be stretched out, now it’s a ball. In my mind, that’s what trauma looks like. A knotted, gnarled ball that I don’t want to touch and the only way to release the massive knot is to gently tease apart the rope. I just don’t want to do it. It would be hard and tiring and might make me agitated and upset in the process. Sure, for an $8 dog toy from Kmart, who cares, but what if that knot is your family lineage? What if that knot, once clean and flexible, is now passed down your family line growing ever tighter and twisted filling with gunk and anxiety. This is what happens with ancestral trauma. Maybe you’ve heard it as transgenerational trauma, intergenerational trauma, or historical trauma, but it’s all one in the same. It’s trauma passed down our family lines, either because no one wanted to talk about the trauma or face the trauma or because they literally couldn’t talk about it or face it. Maybe to talk about the trauma would be to face more violence or humiliation or maybe there were/are no resources to help heal. Maybe they died because of the trauma, therefore leaving no space to share stories or heal. Maybe they didn’t know there even was trauma. Maybe the trauma is still going on today, but it’s just morphed into something different. Familial trauma directly impacts our cultural or societal trauma; what happens in the micro happens in the macro. Everything influences each other and that’s why healing our family lines also helps to heal the collective. Some of us have the privilege of not only knowing who our parents are but have the ability to access information from them about their parents and grandparents. Some people are privileged to have ancestors who had records kept. Some are privileged to have ancestors that were treated as human and therefore have photographs and mementos and names and birthplaces and death-places documented. Sometimes hard truths are revealed through DNA testing when ancestry sites have lack of documentation. Sometimes trauma healing can only be done intuitively through energy/bodywork where areas of the body are investigated for stored trauma. The different places in which our body stores trauma can reveal particular circumstances our ancestors endured. We hold trauma in our cellular makeup; it travels through our parents, our grandparents, our old, old ancestors. It continues to travel like a winding snake until we finally shed the skin. And god, there is a lot of skin to shed. It’s not necessarily pleasant to be the one in the family to say alright, ok, I’m going to deal with this in a very conscious way. I’m opening my arms to whatever comes up. I’m trusting in the process. Sometimes, we aren’t even given the choice. Sometimes the Universe/Source/our Higher Self/our ancestors point to us saying, “that’s the one!” before we incarnate and we come into alignment with different healing modalities. It’s difficult and heavy. Don’t we already have enough to hold in our lives as it is and now we have the task of untangling this giant knot of our family line? Well, yes and no. Yes, we’ve got day to day anxieties and personal traumas ever unfolding, but the thing is, the deeper and longer our ancestor's pain, secrets, violence, burdens carry on uncovered and unprocessed, the deeper our personal pain will as well. We are our ancestors. Our ancestors are us. Whether we’re adopted or not, whether we live on the land of our ancestors or not, we are them. We carry them with us. And they can be our helping hand in the process. So how do we extract the stories, the truths and the myths of our families? How do we acknowledge ancestral trauma healing as an opportunity instead of a burden? How do we hold space for this healing when our family histories are often violent and uncomfortable? We might not want to face some of the things that have happened to our ancestors, we especially might not want to face what our ancestors have been complicit in, either through action or silence. Everything I’m about to say comes from an intuitive place of listening to my guides and a few of my ancestors that have stepped forward in this process. I’ve also gained a lot of knowledge from research and insight from others. There are a lot of people who do work around healing ancestral trauma and this post is merely a brief dot in a large universe of discussion on the topic. In my family, there is a lot of trauma. There is a lot of addiction, mental illness, suicide, and pain, both physical and emotional. Both sides of my family are white and both sides are Catholic. Both sides of my family came to the US (from Sicily(paternal) and Germany(maternal)) between WWI and WWII. Both hold an added immigrant trauma. Both sides are intensely quiet about the buried skeletons and both have deep wounds exacerbated by silence. With these things noted, I was only able to get so far on ancestry.com. I found some key things and had some lightbulb moments but I also knew that finding a marriage certificate is different than hearing stories about traditions and celebrations, intimate family dramas or effects of poverty or what it was like to run from Nazis. Those are stories long gone now, but still deeply affect. The willingness to be uncomfortable. If you’re white, I guarantee there will be some aspect of white supremacy in your family line. White supremacy is ancestral trauma. We’re here to heal this, to excavate and acknowledge and repair the violence our families hold. “Somewhere in our lineage we can find ancestors who participated in some form or fashion of slavery or abuse and it’s always painful to confront that. The very essence of doing any kind of healing work involves confronting a wound, confronting pain, confronting suffering and that’s never easy or comfortable.” —Dr. Judith Rich. A lot of my fellow white people might yell, “my ancestors did that, not me!” Well if we’re looking through the framework of trauma being passed down the familial line then sure, you didn’t perpetuate that act of violence, but it’s affecting you now and you have the ability to stay complicit in what your ancestors did just in a different way. This isn’t about blaming or scapegoating our ancestors but discovering the ways we are impacted by their experiences and therefore how we impact our current society. We might also be uncomfortable when we find out about sufferings and pain our families went through. Even the ancestors we never met will still have an impact. Maybe there were miscarriages, maybe there was slavery, maybe sexual assault, maybe concentration camps. Being called to do this work is an acknowledgement of understanding what our families went through and how we're still holding it now. Like I said before, some of us might not have access to information about our ancestors. Maybe documentation was never part of cultural practice or it was destroyed because of power dynamics. Maybe there are patches of information missing or your uncle and aunt have vastly different recollections of the same event. This is where our intuitive tools can come into play. You can access ancestral understanding through your natal chart and through dreamwork. You can see a trusted psychic or perhaps do automatic writing, but I’m here for tarot! It was after Benebell Wen wrote, “rather than be the punisher and executioner, if you seek to transcend the trauma or transgressions experienced by those who came before you, which you have inherited, use The Lovers to heal that generational or ancestral wound,” that I began to deeply focus on how I could use tarot to understand and heal the muddled ancestral trauma. The Lovers presents us with a choice, a divine gesture of staying or leaving. Moving forward or becoming stagnant. With The Lovers, we have Gemini/Air, thick with communication and power of the mind. We find a certain kind of autonomy here, a very intentional way of existing. The Lovers can be about love and romance, yes, but zooming inward to the card, at its core we have the very essence of the tarot: free will. 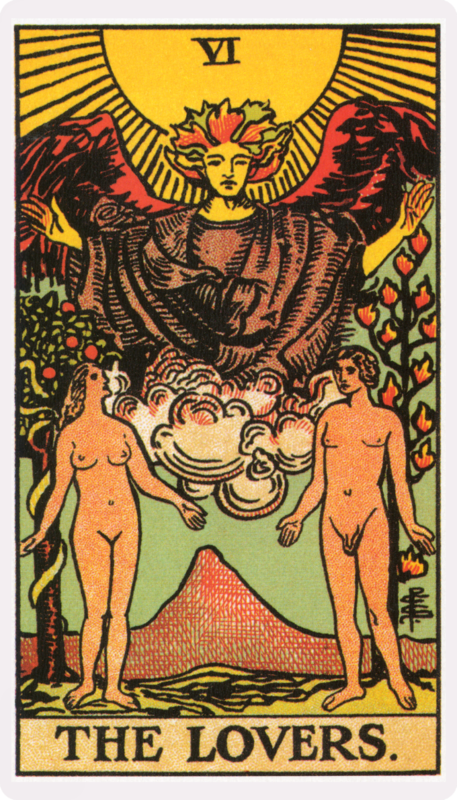 Let’s consider the Smith-Waite deck illustration: The Lovers is portrayed as Adam and Eve in the Garden of Eden. They are in paradise with Archangel Gabriel, the messenger of God, overhead. In the biblical story, Adam and Eve’s experience is considered the original sin. Benebell Wen relates this to the beginning of ancestral trauma. Not specifying what our ancestor did or had done to them, but that there was a point in time where trauma began. There is always a beginning and like the snake in the garden with its tail in its mouth, trauma is an everlasting circle until someone decides to break it. We can use tarot to speak directly to Spirit and have the answers laid out before us. Sometimes in order to understand Spirit, we really need to engage with symbology, which is what the tarot gives us. Using tarot to do healing work often gives us direct access to speak with our ancestors in an intimate way where we are deciphering their messages ultimately making this healing a joint effort. Remember, ancestral trauma isn’t just cellular but can be projected and picked up via energy (in other words, you don’t have to be blood related to experience an ancestral line of trauma). This might be the first step or perhaps you’ve already been working on ancestral healing. Whichever, I think it’s really important to be in communication with our ancestors. Create an ancestor altar or keep a log of your findings. Thank your ancestors, ask them to guide you as you uncover stones to create pockets of freedom in the familial line. When we heal our ancestral lines, we pave ways to heal the greater collective trauma. When we take into consideration the historical events surrounding our ancestors, we can better understand the reasons why trauma was present in their lives. We can reframe seeing this work as a burden and instead give thanks for the opportunity to serve ourselves and our ancestors to help cleanse familial shadows and thus make way for the expansion of collective healing.